Bob Brewer answers your questions about the world of craft beer and brewing. Katie: When are hops ready to pick? Bob: The easy answer is when they’re ripe. Hops usually ripen, if that’s the proper term, in late summer/early fall. The plant is a fast-growing perennial that dies back every year. The cones are ready for harvest when the vine, technically called a “bine,” has reached its maximum growth and the cones have a readily discernible fragrance, as well as a slightly sticky feel. They should also be harvested before the plant begins to turn brown and begins its annual die back. Joe: What do you do with the spent grains? 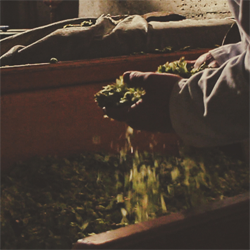 Bob: In our ongoing tradition of recycling all of our brewing byproducts, we pass on our spent hops, along with the spent grains, to a dairy farmer for cattle feed. Do you have a question you’d like to see answered in “Ask Bob Brewer?” Submit your question in the comments below or post it on our Facebook page.